Does Kerastase Resistance Ciment Thermique Work for Hair Repair? Managing damaged hair can certainly become a trial in fortitude, as your patience is tested with every brittle strand that won't seem to stay in place. Hair that is very dry and prone to breakage has a tendency to be frizzy, making styling techniques more difficult. Hair can also be naturally prone to dryness, which is why it's important to adopt a conditioning routine that will keep your hair supple for as long as possible. When one habitually uses heating tools, the cystine bonds within the hair shaft begin to deteriorate and lose integrity. That's why utilizing preventative measures to protect your hair from the effects of heat and chemical treatment is paramount. However, even the most diligent practices can't protect our hair from everything, and sometimes the environment plays an even larger role in the quality of our hair. For instance, prolonged exposure to sea water can dry out hair due to the presence of highly concentrated salts in the water. Particularly arid environments can also create havoc on hair, especially if it's already damaged. Kerastase Resistance Ciment Thermique is a product that claims to offer heat protection while simultaneously working to replenish the natural shine of your hair. While it may provide some level of shielding, it's unlikely that the product will work to penetrate the hair shaft and repair it. Damaged hair can be masked with conditioning products, but those looking for a more comprehensive treatment may find themselves disappointed with Ciment Thermique. Essentially, if your hair is broken and severely damaged, it won't offer any miracles. However, if you'd like to protect your hair from further damage, the Kerastase formula will act as a cushion from the most direct singe of the heat. If you are chemically treating your hair with dyes or relaxers, this product will likely not net you many results. 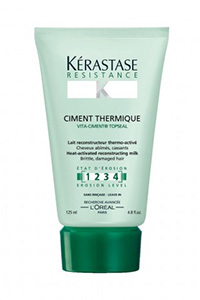 Kerastase Resistance Ciment Thermique is primarily intended for use with irons and blow dryers, and it's recommended that you comb a small amount of the product through while your hair is still damp. Some customers have reported success with using the product in their regular routine, while others have been dissatisfied with the composition of the formula, insisting that it merely sits on top of the hair without providing any conditioning effects at all. Overall, Kerastase Resistance doesn't appear to offer any extraordinary benefits, and especially not reconstruction therapy, as its product description may lead one to believe. It seems to get hair noticeably shiny upon initial use, but the anti-frizz qualities of the product don't appear to last long term. Kerastase products can be purchased online from large retailers like Amazon.com and Drugstore.com. It's actually a bit hard to find in stores, so ordering online will likely be the most convenient option. However, this particular product is quite steeply priced, so before committing to buy, you may want to consider other options and study more product reviews here.